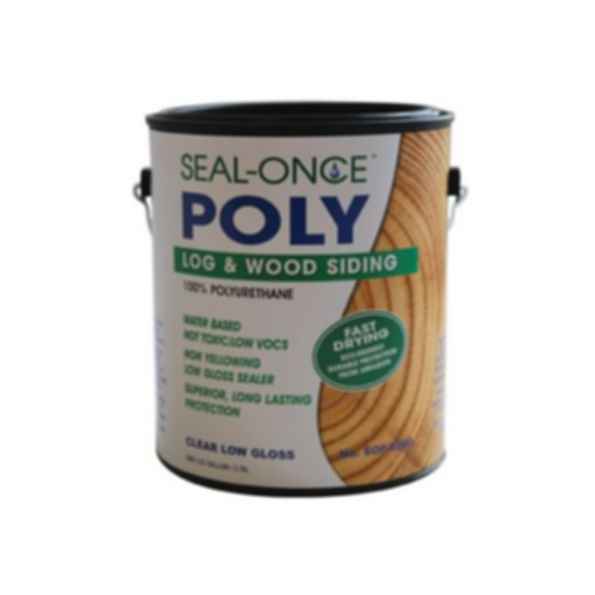 Seal-Once™ Poly Wood 100% Polyurethane is a single component, water-based aliphatic polyurethane. With an elongation of 210%, Seal-Once Poly is a low viscosity, low sheen sealer. Polyurethanes are the most popular sealer choice and Seal-Once Poly is the environmental choice of urethane sealers. Harder and more durable than acrylics and alkyds. Seal-Once Poly has excellent adhesion, is fast drying, low VOC's and is not toxic. Seal-Once Poly is the optimum sealer for a beautiful, durable, long lasting appearance, with just two coats. Seal-Once Poly is UV stable which defines the effects of UV light on the polymer. Uses: Wood Siding, Logs, Log Homes, Wood Trim, Shakes, Shingles, Outdoor Furniture, Garage Doors etc.